Last week, Theo Yasause, the director of Papua New Guinea’s Office of Climate Change, was suspended while an internal investigation of the office is carried out, reports Australian Associated Press. For several weeks, the government of Papua New Guinea has been embroiled in a scandal over the issuance of a series of REDD credits, in the absence of any policy or legislation. Yasause denies having done anything wrong. Two journalists have been covering these REDD developments in Papua New Guinea: Natasha Loder is based in the UK and works for The Economist; and Ilya Gridneff, works for the Australian Associated Press in Port Moresby, PNG. This post is an attempt to summarise their stories so far. Please visit their blogs for more information. Loder blogs on Overmatter: Leftovers from the science desk at The Economist and Gridneff on Papua News Guinea. 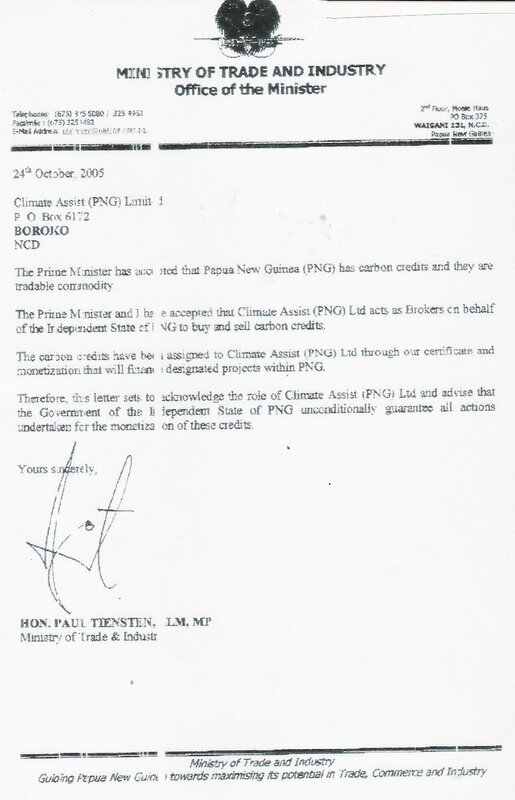 The story broke on 4 June 2009, when Reuters reported “evidence of a multi-million-dollar offer of assistance from carbon brokers to a government agency, and confusion over whether offset sales were from valid projects.” The carbon brokers were Earth Sky and Climate Assist PNG and the government agency was the Office of Climate Change. Betha Somare, press secretary for the prime minister, said in a formal statement “the OCC has no legal mandate to issue any forest carbon credits, other than afforestation and reforestation through the Clean Development Mechanism, nor is there currently any REDD asset in existence due to a lack of a regulatory framework for forest carbon in Papua New Guinea”. Officials are now looking in to how REDD credits came to be issued. Also on 6 June 2009, Natasha Loder wrote on her blog about the Kamula Doso REDD credit. In 1990, logging company Rimbunan Hijau sought an extension to one of its logging concenssions in Western Province. The government granted the extension for Kamula Doso’s 800,000 hectares of primary forest. In October 2008, PNG’s Supreme Court ruled that the order sought by Rimbunan Hijau for the logging extension was improper. Kirks Roberst of NUPAN PNG have been working with the landowners of Kumula Doso and made representation to my Office. We issued an Interim copy of the Certifcate dated 3 Nov 08 on the basis that they will undertake wide stakeholder consultation covering all landowners, provincial and local government before such project can be entertained. The Original Certificate was kept in my Office but someone took that out and leaked it out on circulation. No documentation were submitted with proof that consulation were undertaken and the people are happy with possible carbon trade. We have since ceased dealing with NUPAN as all landowners are not involved nor does the provincial and local governments in that area. We have stop any direct links with NUPAN since 3rd February. Forestry and ourselves were stoped by Court no to log or undertake carbon trade. The credits in question were not sold or given to anyone as yet. This is because no Project Documentation were submitted to my satisfaction which would than be submitted to VCS for verifying. Furthermore, there is a Court Injunction, in place and any dealing will be in contempt of court. Therefore, we have ceased dealing at this stage. from my side no credits were sold nor bought by anyone. Nor have the Office benefited in anyway. Carbon Planet, an Australian “carbon management” company, is developing the Kamula Doso forest into a REDD carbon trade project for Nupan. “There are in existence a group of certificates issued by OCC to Nupan for Kamula Doso. They are not real certificates. They are symbolic to the fact that Nupan is recognised by OCC as rightful developer to the landowners of Kamula Doso,” Jim Johnson, Executive Chairman and CEO of Carbon Planet, told Loder. “I’ve got nothing to talk about,” he said. “I am really sick of you people casting aspersions on my company. Johnson responded: “I am not explaining at all. I am not having this conversation,” before hanging up. Dr Filer has contacted me as an academic who knows about a huge story of international significance and it turns out that he has some other non-academic connection that he is now refusing to disclose. Dr Filer, it turns out, has worked for Carbon Planet. His job was “to write reports about the institutions that might be used to distribute landowner benefits from REDD projects”, Loder writes. Once she’d found this out (by writing to the vice-chancellor’s office at the University), Loder asked Filer again what he knew about Kamula Doso. “[S]adly Dr Filer didn’t want to talk to me any more,” Loder writes. Loder points out that while much of the focus of governance issues is on poor countries, the same standards have to apply everywhere: “transparency is necessary everywhere if this market is ever going to work”. it really does matter when someone comes to buy $20m of carbon credits who has verified that they exist. In medicine, disclosure of consultancies is the norm. I think forestry consultants everywhere are going to have to start paying more attention to disclosure and transparency, particularly in relation to work done for carbon brokers and traders. This company sought to negotiate Carbon Credits in the market places that were not issued by this Office. This Office has had no dealings with this company in respect of credits issued. We were aware of this some months ago. We have our lawyers pursuing this matter with foreign law enforcement agencies as a matter of fraud. As such we cannot comment further on it. Loder spoke to Gregory Corby, of Climate Assist. “[H]e says he has made a complaint to the Attorney General in Papua New Guinea, and his lawyers have told him not to say anything,” Loder writes. 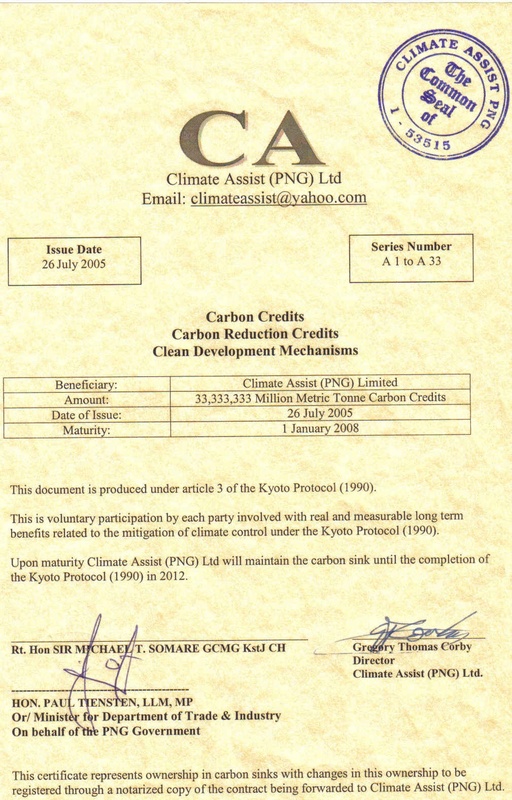 The document refers to the “Kyoto Protocol (1990)”, although the Kyoto Protocol is dated 11 December 1997. He said, the credits had changed dramatically over the years, and these early credits were used to start his business. “We couldn’t get them into trade or anything like that. And I had to go back to Papua New Guinea, it was 2007 and get others issued, and then I went back in 2008 and we got the last original ones issued.” . . . . Mr Corby went on, “the Papua New Guinea government gave us the credits and made us the brokers to monetarise the credits.” In addition, Mr Corby said he had a long-standing relationship with the Prime Minister. However the PM’s press secretary denied this when I asked her a few weeks ago. Perhaps even odder, in his letter to Carbon (PNG) Dev. 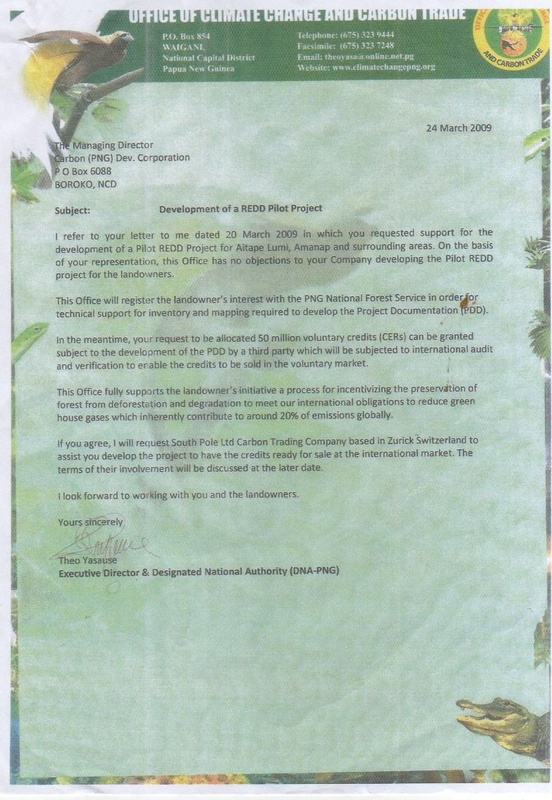 Corporation, Yasause writes, “If you agree, I will request South Pole Ltd Carbon Trading Company based in Zurick Switzerland to assist you develop the project to have the credits ready for sale.” When Loder showed the letter to Christian Dannecker, at South Pole, he told her this his firm had never seen the letter, had never heard of Carbon (PNG) Dev. Corporation, and knew nothing about these projects. Mr Dannecker has some observations and questions of his own. Why does does the letter refer to CER credits? This is a good question, voluntary credits go under the term Verified Emissions Reduction or VER. Where does the value of 50m voluntary credits come from? Another good question, the value of the carbon in any forest is not down to the government to decide. Finally, Mr Dannecker observes that merely a letter of support or approval is satisfactory in such circumstances. South Pole Carbon is already formulating a complaint to the Office of Climate Change about the use of his company’s name in this context. He adds, “we appreciate that he thinks of us but would like to be informed beforehand”. Meanwhile, both Loder and Gridneff have written about conmen who are travelling from village to village offering fake carbon trading deals and promising huge returns. Villagers hand over about US$500, for “registration as a shareholder” in a carbon trading company. They receive a receipt and the conman leaves, never to be seen in the village again. “People in the bush are calling it ‘money bilong sky’ [sky money] or ‘selling the air’ or ‘selling the gas above’,” WWF’s Dave Melick told Gridneff. PHOTO Credit: Borrowed from The Economist. Where is Kevin Conrad in all of this? He was an original player… and supposedly the subject of much naysaying conversation at the recent talks in Bonn? And what about Coalition for Rainforest Nations and all the groups behind it that started all of this? I was swindled out of $65,000 based on these carbon credits. Who do I report this too? These comments are excellent – but what happens when the OCC and Dr. Yasause are proved innocent of any mis deeds? Will you all retrect your bad statements and apologize? Or do you all just need to say bad things because you are jealous and trying to profit with negative comments? I am a land owner from the Highlands and I have been looked after very well, and I am in consultation with developer very well, all the times, who tells me only what is really happening. Why can’t others be true about this exciting new adventure that will help me feed my family for generations while we watch all our trees grow and grow. @Jimmy – As I explain in a more recent post, the REDD credits fiasco in Papua New Guinea is related to Kevin Conrad and the Coalition for Rainforest Nations, because they are instrumental in pushing a version of REDD that includes carbon trading. @Brian – good question. I’d love to hear more about how you were “swindled out of $65,000 based on these carbon credits”. But I’d suggest you should take advice from a lawyer first. @jackson – I suspect you mean “if” rather than “when” the Office of Climate Change and Theo Yasause are proved innocent. You are right, however, that he is innocent until proven guilty. As I pointed out in the post, “Yasause denies having done anything wrong.” This post is a summary of what two journalists have uncovered and written about. Their work indicates certain irregularities about the way the trade in forest credits is developing so far in Papua New Guinea. I believe the carbon trading and the REDD concept is the lesser devil of logging and forest resource harvesting including environmental degradation in the name of development. PNG must embark on such a concept and Nupan Trading is doing the right thing with resource owners at grassroots level. Dr Theo Yasause is in jail with no bail for the murder of one of our great Rugby Leauge players. Dr Yasause as witnesses have said shot the football player at point blank outside a night club in Port Moresby.